What you include in your smoothie has a direct impact on taste. Here are some tips for making sure the produce you select is ready and worthy of being included in your favorite aroniaberry smoothie recipe. At Superberries, we’ve taken care of the Frozen Aroniaberries to make sure that the berries are picked at the peak of ripeness and frozen to preserve the antioxidant and other nutrients. Cantaloupes tell you when they’re ripe – the vine will naturally slip from the fruit when it’s harvest time. You’ll also notice the skin will turn creamy-beige under the “netted” pattern on the melon. 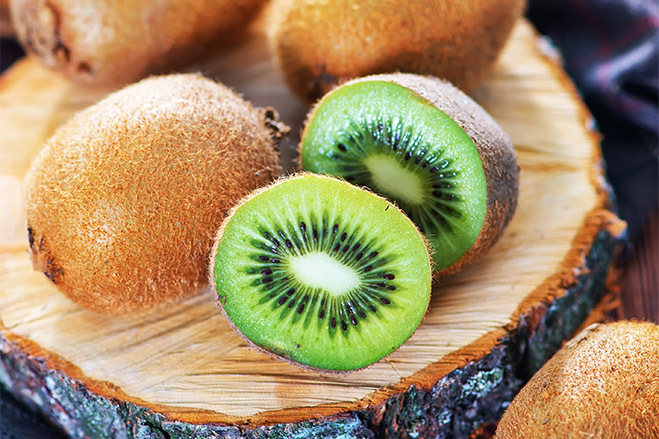 Kiwi contains twice as much vitamin C as an orange. When selecting green or gold kiwis, choose a plump, fragrant fruit that yields to gentle pressure. If only firm kiwis are available, ripen them for a few days before eating them. To ripen, keep kiwis out of the sunlight and away from heat sources. To speed up the process, put them in a paper bag or a vented plastic bag along with an apple, banana, or pear. Store the bag at room temperature for one to two days. Lemons can kill bacteria as they have a high content of acid which makes them suitable for cleaning. Look for unblemished, firm lemons that feel heavy for their size and have no tinge of green. Avoid pale lemons, as they are older and will contain less juice. You should look for an overall softness while paying special attention to the top part of the fruit. You want to see the stem oozing with a little stickiness as it means it is ripe and perfect. Color matters when selecting pineapples. To get the ripest, sweet tasting pineapple you want a yellow golden shell. Use your nose – it should have a light sweet scent. It should feel heavy for its size and have a firm, yet soft enough shell that gives slightly. The ripest pomegranates are not shaped like balls. You will want to look for flattened angular sides rather than perfectly round spheres. The color of a pomegranate can vary from light to dark red. No matter the color, the real clues to ripeness are the smoothness and firmness of its tough leathery skin. Pick it up. A ripe pomegranate should feel heavy for its size; an indication that the seeds are full and juicy. When selecting a watermelon, pick it up. Big or small, it should feel heavy for its size. Look for the yellow spot - watermelons develop a splotch where they rest on the ground. When this splotch is creamy yellow, it's ripe. Tap the underbelly. A ripe one will have a deep hollow sound. Under-ripe or overripe ones will sound dull. Order our Superberries Smoothie Ebook for a complete guide to buying the best smoothie fruit. Plus our Smoothie Recipe E-Book features 32 healthy smoothie recipes that have the option to be made with Superberries Aroniaberry Concentrate or Frozen Aroniaberries. The smoothie recipe book includes citrus & tropical smoothies, garden veggie smoothies; smoothies made from fruits, nuts and melons; and dessert smoothies.